The Palestinian Authority (PA) has condemned statements made by Iranian President Mahmoud Ahmadinejad on Palestinian statehood, saying they only serve Israel. Ahmadinejad said Friday that potential recognition of a Palestinian state by the United Nations should only be a "step forward" for the "full liberation" of Palestine, according to AFP. A Palestinian spokesman told Aljazeera that the Iranian position does not contribute to the peace process in the region, but rather gives the Israeli rightwing coalition in government reason to question the intention of the Palestinians in going to the UN Security Council in September. "It is not enough for them (the Palestinians) to have a weak, powerless state in a very small piece of Palestine. They should unite to establish a state, but the ultimate goal is the liberation of the whole of Palestine," he said. "I urge the Palestinians never to forget this ideal. Forgetting this ideal is equal to committing suicide. It would be giving an opportunity to an enemy that is on the verge of collapse and disappearance." 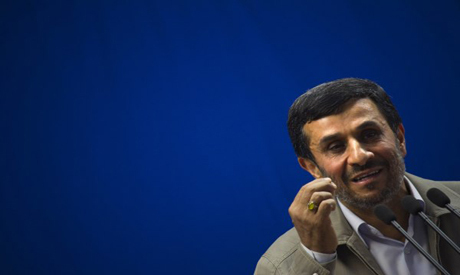 Ahmadinejad's remarks came as tens of thousands marched in Tehran on "Quds Day" — an annual regime-sanctioned demonstration in solidarity with Palestinians and against Israel. Palestinians want a Palestinian state to encompass the Israeli-occupied West Bank and Gaza Strip, with East Jerusalem as their capital. Israel occupied all three areas in the 1967 Arab-Israeli war.